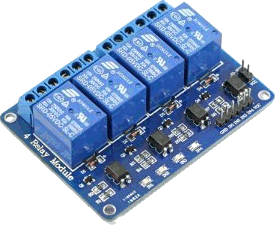 If you have bought one of these 4-way relay boards and are having trouble connecting it up, this page explains what's going on and how to connect it without damaging your Arduino. There are also 2-way and 8-way versions. The first thing to understand is that the relay coils each take about 70mA at 5V, so be careful that your total current consumption does not exceed the safe maximum for your Arduino taking into account other circuits and the rating of the power supply. The board has connections as shown in the table below. There is a ground pin (GND), four pins to control the relays and a VCC pin. There is also a jumper labelled VCC/JD-VCC that connects the VCC pin on the 6-pin header to the JD-VCC pin so that the same supply drives both opto-isolators and relays. For the Arduino, which has output pins running at +5V, the jumper can be fitted and the same supply can be used, subject to the current limits mentioned previously. VCC and JD-VCC jumper Put the jumper on if you want to drive the relay coils. Leave it off if you just want to test a program without actually switching anything. With the jumper off, the indicator LEDs will still light but the relays will not switch. Do this with a Raspberry Pi.